Engaging celebrities and sports starts in awareness building. This map shows a vision of athletes adopting different neighborhoods of Chicago, and supporting programs in those neighborhoods with time, and dollars, and as leaders. Thus, when an article about an athlete is in the Tribune or other local papers, the writer could end the article by saying, "and there are more places like BBBS" where donations are needed. This PDF illustrates a role athletes could take that would not only support their favorite programs, but all the other tutor/mentor programs in a city. 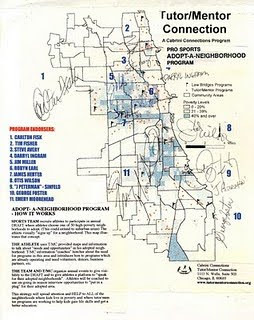 I've been trying to get this strategy off the ground for over 15 years since this map was first created and signed by sports stars such as Otis Wilson, Carlton Fisk, George Foster, etc.